Compact and powerful, the SD series provides high output lumens in an extruded aluminum body. Its unique combination of form, technology and optics allow it to output up to 40% more lumens than similar lights. During manufacturing, each fixture is coated with a ceramic-infused, heat-wicking paint to increase longevity and performance of the LEDs. Quick and easy to install, the SD is designed with the same installer-friendly features incorporated in all RCA lights. The SD series provides evenly dispersed light over a 135° area, making it the smart choice for consumer & commercial projects. Available in 4' and 8' 5000k, 0-10v dimmable models. Delivering 125 Lumens per Watt, our high quality, lab-tested LED chips are paired with an industry-leading LG-Innotek driver. This allows the SD series fixture to achieve low energy consumption and low heat output, which maximizes the lifespan of the LED chips. The extruded aluminum housing doubles as a heat sink and adds strength to the entire fixture. The UL Listed junction box design leaves a lot of room for electrical connections. 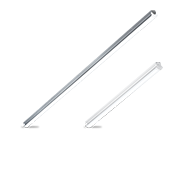 The low profile design is perfect for "close to ceiling" applications. 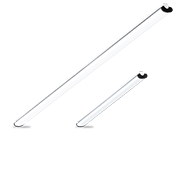 Using reflective and refractive materials to control the light off our angled LED strips allows 135° of evenly distributed lighting. The impact-resistant frosted lens eliminates bright spots that typically cause glare and eye discomfort in direct lighting. 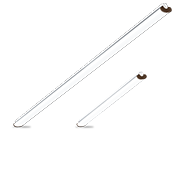 A completely sealed fixture prevents dust and debris build up inside of the light. The smooth, frosted lens makes the exterior easy to wipe down. Standard replacement drivers are available for future needs, unlike most other LED fixtures currently on the market.